It’s getting closer and I can just hear the motors being tuned and just a slight smell of the racing fuel in the air. Another racing season soon to commence. Here’s to the soon to be crowned 2001 champions and have a safe and fantastic racing season to all of you race-aholics. Last month we lost a special racer in John Fedricks. John was a great driver back in the 40’s & 50’s in USAC Sprints & Midgets and was inducted into the Michigan Motor Sports Hall of Fame a few years ago. Our thoughts & prayers go out to his family. 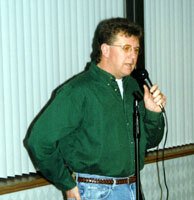 Also, long time member Alex Spence passed away on March 18th after a long illness. His wife, Adele, had been our Secretary/ Treasurer for many years and we send our deepest sympathy to her and her family at this time. I look forward to working with the new Officers and Board Members to continue improving our organization. Kart2Kart hosted the March meeting. Steve Lee and Sandy Heng offered much information about their respective involvement with auto racing which brought up some very insightful conversation and discussion. Steve Lee, former Flat Rock Speedway Late Model Champion and long time driver, explained his son’s beginnings in racing and their plans for the future. 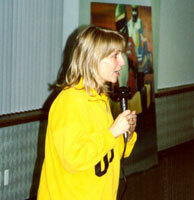 WXYZ-TV sports reporter, Sandy Heng, was on hand to offer some very comical and serious topics. She expressed her concern for driver safety research and let us know just what one may hear on a scanner on any given day. 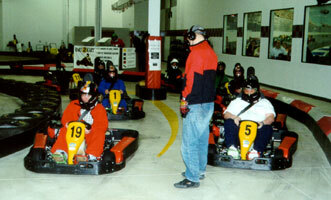 Kart2Kart runs a fantastic facility for kart fans to try their skills. After our meeting, many members took to the track. 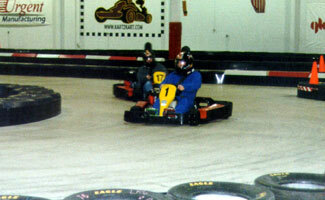 Our president, Bill Barnhart, at the wheel of a kart with a fellow member behind.